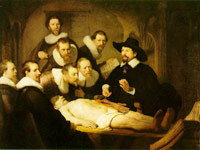 for the show Rembrandt op A4, in Sidac Studio, Leiden. adding a few female figures. current prime minister, Jan-Peter Balkenende. 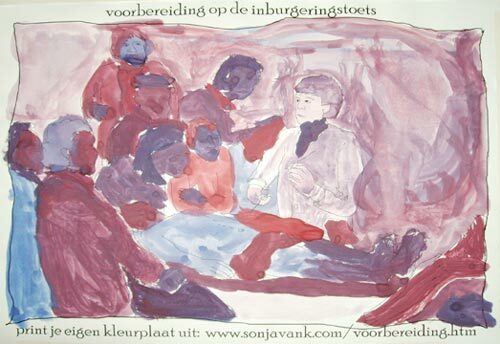 Originally made for the group show Rembrandt on A4, the purple version (below) of the Citizenship colouring page was also shown in another show in Leiden during the Rembrandt 400th birthday celebrations, this time in the Scheltema building in the Rembrandt reception hall. For this show, each artist was asked to work with one particular colour. We chose purple because to the previous less right-wing government was called the Purple Cabinet (Parse Regering) (It was a combination of middle of the road, left (red) and right (blue) parties ). It was a goverment of tolerance and liberalism. The current government brought in the Citizenship exam referred to in the title. 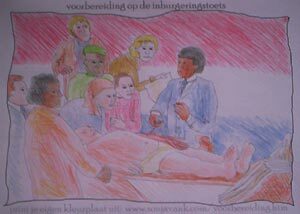 An exam we object to because it is based on discrimination, creating two classes of citizenship in the Netherlands. Those who have to sit the exam (lesser desired migrants) and those who don't (ones from European countries which have treaties with the Netherlands). The exam is not based on a knowledge of Dutch but based on the right way to act or behave, and it has objectional assumptions about foriegners built into the questions, such as one where the assumption is that the foreigner is offended by the presence of two men kissing. The European Human Rights Commission has objected to this new law.